In this award winning book Monica gives us a timeless message: you can be happy no matter what the circumstances of your life --even when your heart is broken, when someone you love is diagnosed with an incurable illness, when you are alone, when you are broke, when you are scared and afraid. And it is so because happiness is part of who you are at the core of your being. Monica teaches a deceptively simple yet deeply transformative Program. It leads you to understand what true happiness is in all its depth, and, even more importantly, it trains you to merge with your core Self and live from it. It guides you to reconnect with it and shows you how to keep that connection clean and pliable so that it is ready and available for you when life is easy and especially so, when it is not so easy, those moments when you need to touch and feel a bit more of peace and light. 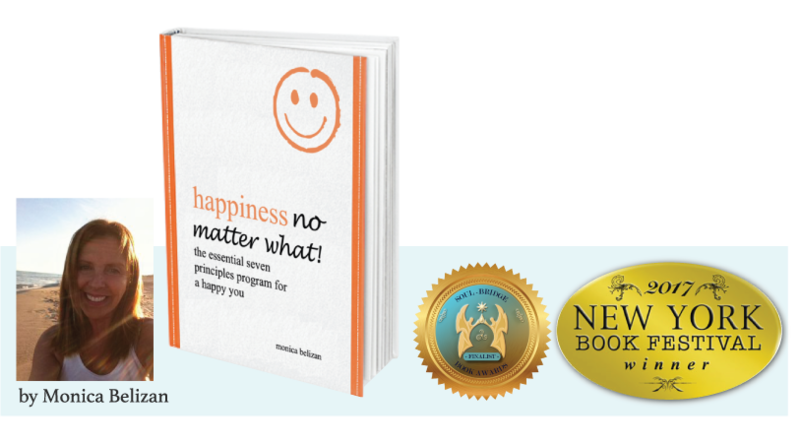 One principle a week practiced a few minutes a day for seven days, will take you to become the happy person you might not have ever thought was possible. · Lead you to unravel your connection to your core, your source of happiness. · Instill in you new consciously chosen life habits that will keep that connection clear and vibrant. · Take you to a place of knowing that can never be broken by anyone or by anything that is happening in your life. · Teach you to train your mind to be present, focused, and clear so you will be able to add richness to your life and reveal greatness.